Does Kavanaugh Finally Make the Real America Public? Sometimes events generate a public fascination out of all proportion to their actual importance. The Tate-La Bianca killings of 1969, conducted by the Manson Family, are still widely discussed today and have turned some drifting hippies only marginally connected with the actual crimes into almost household names. The death of Princess Diana in 1997 created an intense outpouring of grief in the UK, yet no one seemed to know even then why it was taking on such proportions, and people still debate why they got as upset as they did. Now one such event is gripping the United States, and much of the rest of the world. Judge Brett Kavanaugh, nominated by Donald Trump for the Supreme Court, was expected to go through the formal confirmation process without more than a modicum of difficulty. However, that definitely was not the case. As US judges are elected, and appointed for political as well as juridical reasons, each new Supreme Court nomination arouses public comment from predictable quarters. But no one expected the circus the Kavanaugh confirmation hearings became. But what transpired shows a larger reality that all is not well in the system of checks and balances, and how the system is suppose to work, at least as what Americans read about in their government classes in middle school. As a succession of women came forward to accuse Kavanaugh of sexual assaults, both from his college years and more recently, both he and one of his accusers, Professor Christine Blasey Ford, were questioned by the Senate Judiciary Committee. Kavanaugh predictably denied the allegations, but Dr. Ford and the other women insisted. In the US, the concept of “moral character” in public officials is very important, despite the behaviour of its current president and some of his predecessors. For example, fellow lawyer Bruce Babbit sought the Democratic nomination for president in 1988, but dropped out after he admitted he had once smoked marijuana – not because he had broken the law, but because this represented a “character flaw” then considered unacceptable in a senior politician. If the allegations against Kavanaugh are true, he is not a fit and proper person to be appointed to the Supreme Court, regardless of his legal ability and impartiality, or acceptable partiality, as a judge. His friends know that as much as his enemies. But the way the US has divided over this issue says rather more than either side would like to admit about what that country has become, and the danger this represents to the world as a whole. Kavanaugh and his supporters insist that all the allegations are untrue, and would have shown up in vetting for his previous roles if they had been. They insist that there is no evidence to support them, and that the accusers are not credible because they waited so long before saying anything, and that the whole thing is a Democratic plot, fabricated because the opposition has no professional grounds for objecting to his nomination. His opponents insist that there is plenty of anecdotal evidence supporting these allegations, and that by their nature there will be few witnesses. They also say that they are not the sort of things you report openly until long after the event, particularly when they involve influential people, as other cases have demonstrated. They have called for an independent investigation of this alleged law-breaking, and accused the other side of the same thing they themselves are being accused of – trying to force the nomination through for the sake of it, because there are no professional reasons for supporting it. We may never know the whole truth about these allegations, and most people are temperamentally predisposed to take one side or the other. But the interesting thing is not that different people want to believe different things, but how the two sides have divided up. It is no longer about right or wrong, but a political redline has been drawn. We would expect Republicans to be on one side, even if reluctantly, and Democrats to be mostly on the other. But in fact the divide runs between two Americas: the official and unofficial ones. mass media outlets such as Fox News and the National Review, whose “independent” take on things always seems to coincide with what US political leaders of the day are saying. His opponents are a cross section of survivors, malcontents, minority rights advocates and disgruntled citizenry: people who feel that a better lot is their birthright, but it has been stolen from them by political leaders who do not listen to or care about them. Some Americans may find these coalitions surprising. But not those who have lived in countries the US has chosen to “protect” in the name of “democracy” and “human rights”. They are only too familiar with the difference between the official versions, those which come out of the mouths of politicians, their media lackeys and those who support them because they can’t bear to face the truth, and the unofficial ones, which come from people on the ground who are often pro-US in theory, but see the big difference between what the US says about their country, which they think SHOULD be true, and what actually exists. People will always believe who they want. But when Official America so blatantly behaves at home in the way it always has in other countries, and its own people begin to recognise it, this can have serious consequences for the rest of the world. If US allies decide that their marriages of convenience are no longer worth it, they will look for other partners. None are stepping forward yet, because no one else has yet devised, or offered, a better or more attractive system than the one the US theoretically does, with its equality of opportunity, freedom and tolerance. But if countries choose to replace one bad situation with another, on the grounds that it can’t be worse than the one they have, how long will it be before they discover, like the Soviet Union, that they were wrong all the time? As a judge, Kavanaugh knows the importance of the quality of evidence. If the truth is presented in an unsubstantiated and haphazard way, but lies presented with all the appropriate documentation, witnesses and objectivity, lies have to win the day in a court of law because the liars have followed the rules. If Kavanaugh had been judging his own hearing, he would not have found the quality of evidence he himself presented as satisfactory. His “noble” speech was full of wilful misdirection and obfuscation. His techniques included answering questions with questions and misrepresenting what other witnesses had said, in a manner which the general public may not have noticed but he, as a lawyer, was fully aware of. For example, he stated that Ford´s allegations had been “denied” by people Ford said had been at the party at which the alleged assault took place. Not one of the people identified has denied the allegations – they have said they “don’t recall” such a party or incident, but not that they didn’t happen. This is a small but significant difference. Similarly, Kavanaugh said that the only time such a party could have taken place was on a weekend. In true lawyer fashion, this statement directed attention in one direction and diverted it from another, i.e. anything which might have happened on other days of the week. He has however released calendars of his activities which clearly show some such gatherings taking place on weekdays – including one involving the people Ford says were there, but Kavanaugh says weren’t. This does not prove that Ford is telling the truth, and that Kavanaugh is guilty of sexual assault. But it does show that a lawyer, who knows about such things, is giving evidence to his own confirmation hearing which he knows is not satisfactory. There may be reasons why he would do that, but he refuses to give them, instead saying that his word is law, however inadequate that word is by the standards of his own profession. There are many similar examples of inadequate evidence being presented by Official America when faced with awkward questions. For example, when Matthew Bryza was the US envoy to Georgia he routinely stated that the elections there were broadly free and fair, despite the fact no one who lived there, and had seen those elections, believed a word of it. Then he announced that one particular election was a “big improvement” on all previous ones. Anyone who lives in a democracy knows there can be small improvements on free and fair elections. But if they are already free and fair, how can you have “big” improvements? Even these “big improvement” elections were blatantly rigged, and on a scale far exceeding anything Trump is now being accused of colluding with the Russians to do. Human rights organisations made this clear at the time, in reports which featured photos of “final election results” extracted from a returning officer’s pocket while the vote was still going on, and the black eye and puffy face of a beaten up election observer. But despite the inadequate quality of evidence, the US mainstream news media, its politicians and millions of individual Americans insisted that a lie must be true if the US said so, because the US is the greatest and most decent country on earth. If anyone disagreed, they were either denied a mainstream media platform or derided as enemies of the state, and of the American values all right-thinking people share, when all they were doing was saying what they believed to be happening, as the US was. One of the arguments for democracy is that if you have a pluralist system, and free elections, you are more likely to avoid the corruption which comes with having one set of leaders who do not have to answer for the people for their actions. One of the arguments for rule of law, and human rights, is that these things protect people from bad conduct but are no threat to good, while the absence of them threatens good conduct and encourages bad. So many people still see the US as the force most likely to bring about these benefits. If it upheld its own principles, it would be. But if people are only clinging to this hope because no one else is offering anything better, this presents other powers with a challenge they may one day live up to, thus turning Official America into Lewis Carroll´s Snark, his case no longer heard but bellowing on to the last. 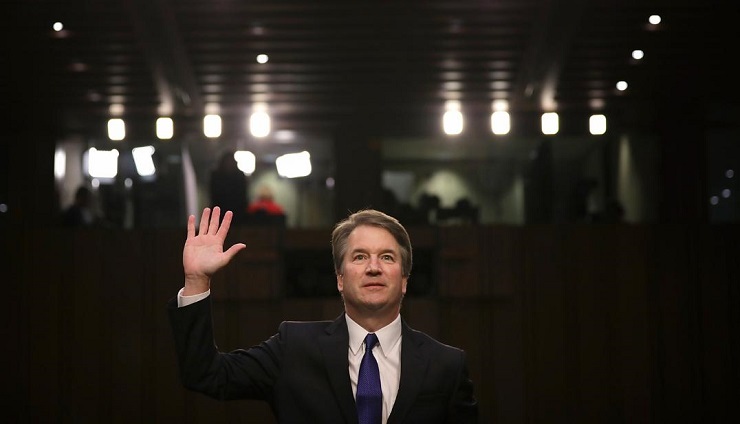 In spite of his refusal to present adequate evidence at his own confirmation hearing, Kavanaugh has been confirmed as a fit and proper person to take his place in the Supreme Court. No judgment has been made on the allegations against him, other than to say that whether they are true or not doesn’t matter, because he has shown by his conduct at the hearing that he is “one of us”. Kavanaugh protests that the unproven allegations have damaged his good name and caused great distress to him and his family. This is exactly what Official America says: you can’t say that about us, because we are beyond criticism by little people like you. But such a distinguished lawyer as Kavanaugh should be capable of mounting a better defence than that. The evidence he presented, as well as being inadequate, often contradicted the claims he made. The confirmation hearing should have been his finest hour, his chance to show his credentials to the world, and he did the opposite. Instead, it shows the potential nominee at his very worse, highlighting serious character flaws and did more to put the noose of public opinion around his neck all by himself. The Kavanaugh case isn’t going to go away. It raises many questions about what is important, and what sort of values the US has, and should have. But most of all it exposes the difference between the America people hear about, and the reality they see. During the Cold War the US routinely poked fun at Soviet propaganda, which gave a false impression of what life was really like in Eastern Bloc countries. It stated that those who spouted such things were only doing so because they were scared of facing reality. We are all in for a very bumpy ride when the American public wakes up to the fact that the Soviet Union won the Cold War, by turning the US into everything the Soviet Union once was – and that all US allies have known this for a long time, but they didn’t, and now can’t do anything about it.